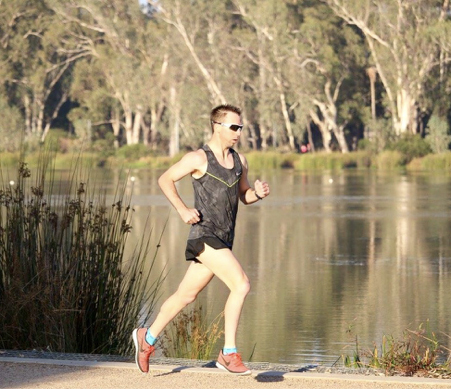 Coach for the Shepparton Runners Club is Chris Armstrong, who takes three sessions per week. The Tuesday session is held at the Victoria Lake, Shepparton, near the Shell Service Station, beginning at 5.45pm. This session goes for an hour. Chris plans and takes the group, either through a fartlek, a speed session or a tempo run and he also organises a yoga session once a month. Chris is a great believer in regular yoga sessions, to help reduce the likelihood of injuries. Thursday sessions are more relaxed, with an out and back easy run as a group. This session starts at 5.45pm and finishes at 6.45pm from the Runners Club clubrooms at Princess Park, Shepparton. The purpose of these sessions is to just turn the legs over, because many within the group regularly participate in Parkrun and we all need fresh legs for 8 o’clock on a Saturday morning! Sunday morning session is a social run catering for all levels of runners at 8am meeting at Runners clubrooms at Princess Park. Chris has completed his Level 1 Recreational Run Leader course and possesses a lot of experience and knowledge in running. He is also coached by a highly regarded runner- Brady Threlfall. Chris’ affable nature is an asset to the club and we value his expertise highly. A number of our members have also completed this same course, making for a club which has much expertise to draw from. This allows for smaller groups to be catered for and includes all levels of fitness and ability. To keep up to date follow us on Facebook or find out through our weekly newsletter.